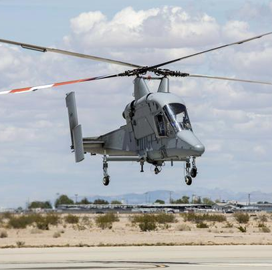 The U.S. Marine Corps is planning to update its Kaman K-Max helicopters to incorporate autonomous capabilities intended to support experimental cargo delivery operations, Flight Global said Thursday. Lt. Gen. Steven Rudder, the Marine Corps’ deputy commandant for aviation, said during a Senate Armed Services Committee hearing last month that the service branch plans to modernize its two K-Max aircraft as part of its K-Max autonomy research effort and Marine Air Ground Task Force – Unmanned Expeditionary Capabilities program. 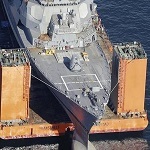 Rudder noted that the initiatives can help the Marine Corps conduct operations amid pilot shortages. USMC began the K-Max effort in 2011 before transferring the helicopters to the Marine Corps Air Station Yuma in Arizona for further experimentation in 2016. Kaman and Lockheed Martin previously teamed up to jointly develop a flight control system that can autonomously power a K-Max helicopter.